Hendon Times (May 17 2007) "Statler and Waldorf's teasing and smartly-worded jibes are sure to rub some people up the wrong way far more than the elected members' efforts." Today 'Johnny come lately' webblogger, Roger Charles Doughty Tichborne, has published a photograph on his internet journal which suggests that Mr Nick Walkey has appointed us to his Cabinet of Councillors. We are unable to confirm or deny this but can let you know discussions are taking place regarding an appropriate package and use of the Mayoral car. Waldorf and I are huge fans of Les Miserables. We were lucky enough to get tickets for the opening night at the Barbican Theatre, back in 1985, and have been addicted ever since. As a free gift to all of our loyal readers we give you one of our favourite scenes (first 40 seconds is introduction). UPDATE: Waldorf and I have been unindated with emails from readers guffawing with laughter watching the clip imagining Monsieur Thenardier as Brian Coleman or Andreas Tambourides and Madame Thenardier as Lynne Hillan or Joanna Tambourides. Waldorf and I can only condemn such wicked thoughts in the minds of our readers. Really. "The Thernadiers are scum....but damn, you﻿ gotta love em!!" Now who could possibly say that of any of our Barnet politicians? Statler and I have been receiving frantic telegrams and carrier pidgeon messages about the Grant Thornton report condemning the handling of the Future Shape program. 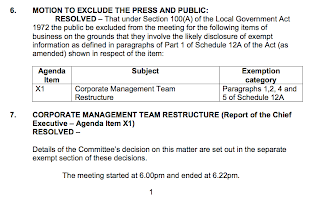 Unconfirmed rumours suggest that Andreas 'Hit Man' Tambourides has instructed fellow Conservatives on Audit Committee that they are not allowed to embarass Lynne Hillan / Howard or the Officers by asking any questions on the report at the meeting. Only questions that have been approved by the Officers can be asked. If Conservatives on this Committee tomorrow night are strangely quiet, you will know why. We are also trying to get a comment from Department for Communities as to whether it is true that they are appointing an independent investigation to look into goings in at Barnet Council in the wake of this scathing report. Johnny come lately, weblogger, Roger Tichbourne has posted here and here on the growing crisis. Statler and I are befuddled as to how a 'politically neutral' Officer of the Council has seemingly become a major player in the public debate between Councillors and Mr Tichbourne. Statler and I have been informed that our erstwhile colleague of many years, Mr Brian Reynolds, has been pushed out by Nick Walkley and his stormtroopers decided to move on to other opportunities which coincided with Mr Walkley restructuring his top team. We wish the clapped out old wooly hatted, thermos carrying commie great man, with a wealth of experience in local government and a staunch reputation for political neutrality, all the best in his staring out of the window from his front room future endeavours. Those with an interest in these matters can read about the restructure what the Council thinks you should be allowed to see here. 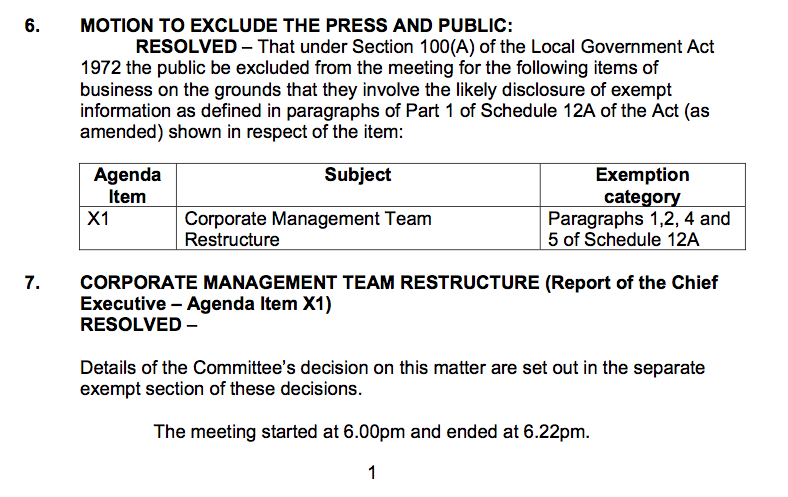 Statler and I have posted an excerpt from the minutes above showing how far Barnet Council is truly embracing the coalition goverment's approach to transparency. Statler and I have been kicking our big brown wooden clockwork Predicting Machine this morning. The damn thing is clearly faulty as it was a whole vote out from getting Lynne Hillan's vote correct. Maybe we are being too harsh as we chose not to pay the extra £5,633 for the Global Positioning System Device add on that would have alerted it to the fact that Alison Cornelius was in Strasbourg and hence unable to vote for her cherished friend, Lynne. Which Councillors will face the chop in Hillan's new wheeze : compulsory deselections? ...There is a national scheme looking at whether it should be three councillors per ward or maybe it should be two, that would shrink the pot immediately. is being worked up now. Increasingly confident of victory against young padawan, Mark Shooter, contacts have apparently already been made with the Boundary Commission for England. We understand Ms Hillan / Howard plans to move fast to reassert her crumbling authority as soon as the Annual Group Meeting is over. The Council has received very positive mood music from the Boundary Commission and, apparently, this move could be expedited as parliament is also moving fast with parliamentary boundary changes. Two Councillors per ward would be in place for 2014 with 'compulsory deselections', here are our predictions for those who Hillan would force out using this new wheeze. So there are our predictions. You will know if we are right in 18 months, not too long to wait. What do you think? Comment below. Statler and I are still trying to find out about this young padawan, Shooter, but in the meantime we are putting our minds to how he can possibly win. It would need an earthquake. This Conservative Group, certainly the Chipping Barnet Councillors, was hand designed by Lynne Hillan/Howard, Brian Coleman and Michael Whitney Freer for the sole purpose of removing Brian Salinger in 2006. In a stepford wives kind of way they are programmed to love their Leader. For this upstart, Shooter, to win he needs 20 votes (unless there are abstentions). So Statler and I, after catching up on Home and Away thought we would speculate on the 20 Conservative Group Councillors most loyal to Lynne Howard/Hillan (depends who's asking (tm)). Brian Coleman - need we say any more? Helena Hart - loyal Freerite and Cabinet member. Mike Freer would have made sure he supports Mrs Hillan. Andreas Tambourides (Licensing Chairman SRA to increase by 50% - meets twice a year - even after supposed u-turn)- together with his wife a big winner in the allowance increases. The Godfather of the outfit. Hugh Rayner (Business Management OSC Chairman SRA to increase by 50% even after supposed u-turn) - loyal henchman of Lynne Hillan. Put out memo defending her decision. Dan Thomas - loyal Freerite and Cabinet member. Mike Freer would have made sure he supports Mrs Hillan. Richard Cornelius - loyal Hillan supporter and Cabinet member. Put his neck on the line, as Chairman, writing a letter to Conservative members in Chipping Barnet without seeking proper support. Andrew Harper - deputy Leader and key architect of the original rise. Ran for cover whilst Mrs Hillan was in Spain but left Coleman do to the dirty work. Seen by most as having undergone a vertebrectomy. Robert Rams - Brian Coleman's poodle and Cabinet member. Joanna Tambourides - Andreas will expect his wife to obey his commandments ! Maureen Braun - Part of the original plotters. Would probably be deselected if Mrs Hillan went. Joan Scannell (General Functions Committee Chairman SRA to increase by 50% even after supposed u-turn) - who loyally followed Lynne Hillan and Brian Coleman's instruction to discipline Kate Salinger in that brutal public way. Alison Cornelius (Health OSC Chairman SRA to increase by 50% even after supposed u-turn) - she has been fighting a strong rearguard action against the rebellious women's committee in Chipping Barnet supporting Lynne Hillan down the line. Darryl Yawitch (Budget & Performance OSC Chairman SRA to increase by 50% even after supposed u-turn) - Lynne Hillan's latest 'blue eyed boy'. Barry Evangeli - one of the new Councillors who loyally followed instructions to ban discussion at the Chipping Barnet Residents' forum. Brian Gordon (Policy and Performance OSC Chairman SRA to increase by 50% even after supposed u-turn) - Lynne Hillan's assistant Cabinet member for a while. Seen as loyal to her. Melvin Cohen - inseparable from Lynne Hillan under the correct assumption that noone else would give him a job in the Cabinet. Lisa Rutter - ward colleagues with Lynne Hillan and Andreas Tambourides, not going to want to rock the boat! Sach Rajput - Cabinet member, all of the Cabinet are behind Lynne Hillan. Wendy Prentice (Planning and Environment Committee Chairman SRA to increase by 50% even after supposed u-turn) - Chairman of the Conservative Group. Bridget Perry - tends to follow her Ward colleague. This is not intended to be an exhaustive list and we have left off many new Councillors who we haven't had time to observe or hear reports about to confidently speculate about. So, chaps and chappesses, what do you think of our fantasy Conservative Group speculation? Which names do you think we have right? Which names have we got wrong? Comment away below - we expect, nee demand, strong debate. Are one of these Councillors your local Councillors? Do you know then in another context? Why not email them and ask them who they are supporting and why?